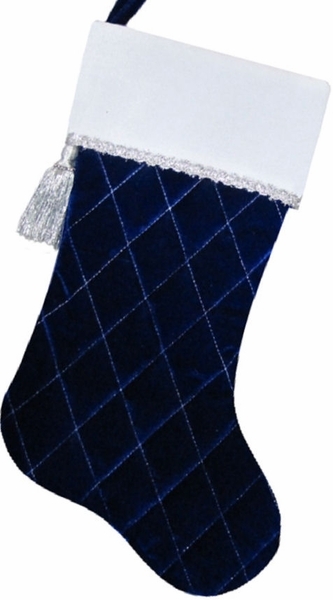 Blue Velvet Personalized Quilted Design Christmas Stockings. We also have the same Christmas stocking design in white so you can make a set. Materials and Design: Deep Blue velvet, with metallic silver trim rope and tassel on the cuff. Lining: Yes. This stocking is fully lined inside in white polyester satin. Measurements: This stocking measures 18.5" diagonally and the top opening is 18.5" wide. Names can be personalized on the cuff of this Christmas stocking with Silver or Royal BLue embroidery thread to compliment the colors of the stocking.